Which NFL team will be the ultimate ‘Social Superbowl' winner? 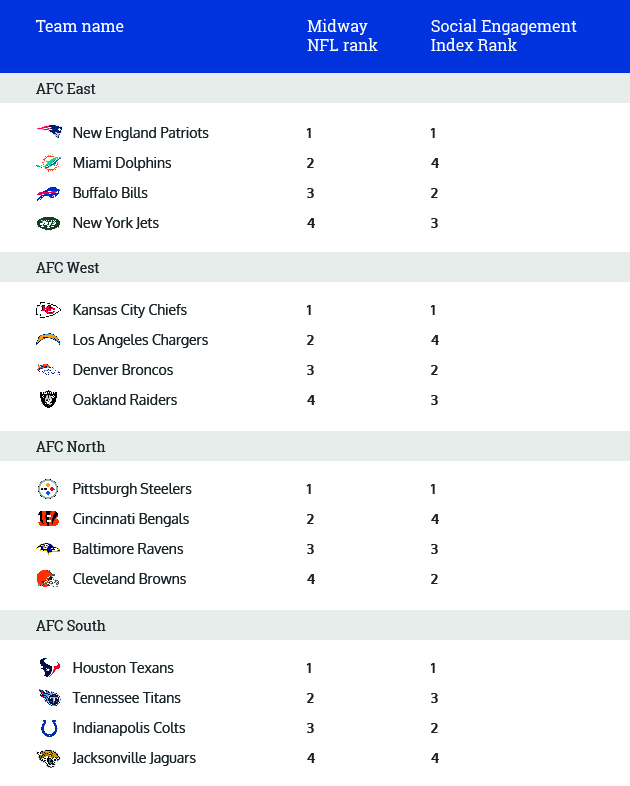 We’re halfway through the 2018/19 NFL season, and it’s the Patriots, Chiefs, Steelers and Texans leading the American Football Conference, with the Redskins, Rams, Bears and Saints leading the National Football Conference. But who’s leading the scoreboard when it comes to their engagement with fans? Crisp Labs, our research arm, has analyzed each NFL team’s Facebook page from this year’s Kickoff Game on September 6 to the midway point on November 6 2018. We’ve looked at the love being given to each team from their fans, who is getting the most engagement, the most shares and comments. From here we applied a formula to each to see just who was winning in the SFL (Super Fans League!). Overall there appears to be more engagement as a whole across the NFC teams compared to the AFC teams. Despite posting almost exactly the same number of posts (5598 for NFC teams, 5526 for AFC), the NFC teams have substantially more shares of their content (2.2M compared to 1.6M) and more Reactions from fans (9M compared to 7.5M). If we look at the percentage of Reactions that are ‘Love’ for NFC teams, they average 15% compared to AFC’s 14%, whereas ‘Angry’ and ‘Sad’ Reactions only make up 2.8% of all NFC posts on average, compared to 3.5% of AFC team posts. So we decided to look at each Conference separately first to see how they fared. In the table below we compare the AFC teams’ current NFL ranking by division alongside their Social Engagement Index score as calculated by Crisp Labs. The most obvious result here is that every team that’s currently leading in their division is also leading in the social engagement stakes. Winning clearly gets your fans to love you. No surprise there then, but what is interesting is when we look at the teams that are in second place. Every single second-placed team features at the bottom (or near bottom) of the Social Engagement Index. 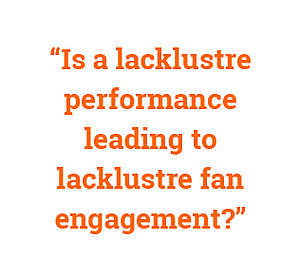 Which poses an interesting question – is a lacklustre performance leading to lacklustre fan engagement? What would happen if fans were more engaged and showed more Love online? Would the teams’ morale be raised? We decided to explore the idea of fans’ engagement being linked to their team’s performance a little closer. Of all the NFL teams (NFC and AFC), those that are in the AFC South are the most likely to generate the least engagement and love from their fans overall. The temptation is to think that this could be related to their eventual chances of winning the Conference or even the Superbowl itself. Especially when you consider that the Texans and Jaguars are yet to achieve either of those accolades. For the Titans, this season marks 20 years since they last had a shot at the title (when they lost out to the Rams) and, although the Colts have seen more success, they’ve only won the SB twice - once in 1970 and, more recently, in 2006. This premise gets even stronger when you look at the AFC division that’s generating the most engagement and love from their fans – AFC West. Here the Raiders have won the Conference five times and the Superbowl three times (though granted the last time was in 1983), the Broncos meanwhile have won the Conference eight times (and the SB three times, the last time very recently in 2015). The Chiefs however, have only won the Conference twice (and the SB once, which was back in 1969) and the Chargers have only made it to the SB once (in 1994 when they lost out to 49ers). There’s clearly a different story here in the NFC compared to the AFC. With the NFC, the teams doing the best on the field aren’t the teams wowing their fans online. Only in NFC South do the teams’ social rankings match their game rankings. In fact, we found that the NFC South division is by far the one with the most engaged fans. 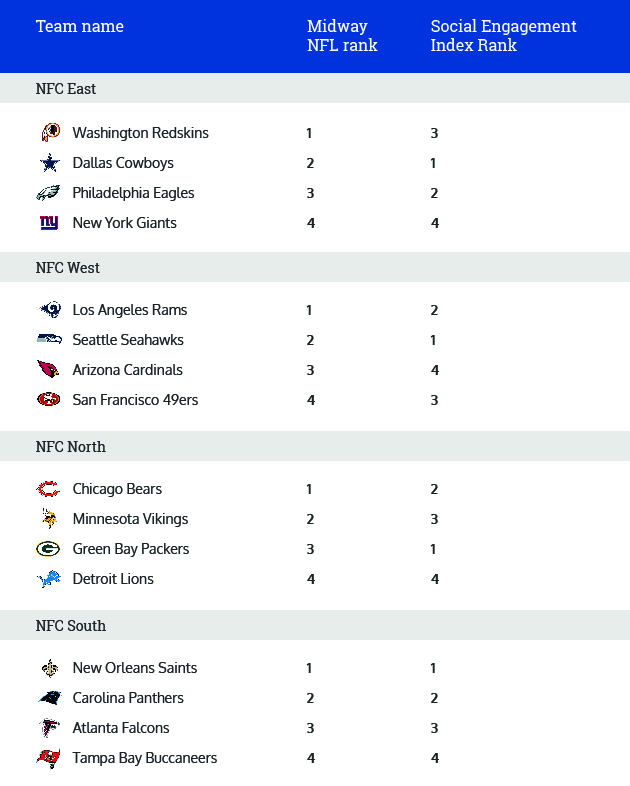 Teams in this division have generated over 800K shares overall, that’s 563 per post, the highest average of all the NFC divisions (NFC West teams have just 266 shares per post in comparison). Posts by NFC South teams also generate a lot of Love - 21% of all Reactions to these teams’ posts are Love, compared to just 14.6% of NFC East teams. They generate the least anger too, with only 1% of Reactions so far being the Angry emoji, compared to NFC East which has 3.9%. There are many reason why this could be the case – from historic rivalries to in-season decisions to individual plays. So let’s look in more detail at the specific teams and how they are engaging their fans. Who’s scoring touchdowns and who’s going bust? The New Orleans Saints are the team with the best rankings of all NFL teams for social engagement. They have the highest level of Love Reactions to their posts by far – nearly 240K! They win out on the percentages too, with their posts having not just the most volume of Love Reactions but the highest Love ratio per post - 22% of all Reactions from fans to their posts are the Love emoji. The Carolina Panthers, who are hot on their heels in the competition, are the NFL team with the second highest Love Reactions count, with just over 194K Love Reactions (which make up 19% of all Reactions posted by fans). Compare this to Jacksonville Jaguars who, with a five-game losing streak, are finding it tough to get the Love from their fans, with only 11.4K Love Reactions given to their posts. That equates to just 10% of all Reactions posted by their fans. On the other hand, they do seem to be winning on humor – 5% of all Reactions are the Haha emoji – the highest of all the NFL teams (and second only to the NFL’s own Facebook page). The Dallas Cowboys are the most prolific posters – coming in at 488 posts since the start of the conference, which, unsurprisingly perhaps, means that they also generated the most comments overall (over 182K). Engagement isn’t just about numbers though. When you look at the average number of comments per post we see that the Oakland Raiders pip the Cowboys to the post, with 410 comments per post on average, compared to 374 for the Cowboys. These teams are certainly generating a lot of discussion. But are they getting the reach? When we looked at the average number of shares per post we get an entirely different picture. Here it’s the New Orleans Saints who are back at the top of the league again, scoring a massive 1219 shares on average for each post. Kansas City Chiefs come in second with 966 shares and the Carolina Panthers in third place with 652 shares per post. The teams struggling the most to get their content out there are the Tampa Bay Buccaneers (only 80 shares per post on average), followed by the Jacksonville Jaguars (82 shares) and the Miami Dolphins (100 shares). The big stats above give us a feel for the trends, but what content is best at driving the best engagement results? The most shared post: by a long shot this was the New Orleans Saints' video of Peyton Manning congratulating Drew Brees on becoming the NFL's leader in career passing yards, breaking his record in the second quarter of a 43-19 win over the Washington Redskins in October. This post gained over 75K shares, and generated over 87K Reactions. Overall, it was the most ‘liked’ post of the League, as well as being the funniest (with over 16K HaHa emojis). So one learning is that responding to a record being broken will win over the fans, especially when chopping up tomatoes. The most commented post: was the postgame reaction to the Titans vs Cowboys game on November 6. It generated over 12.7K comments. You could consider that an excellent level of engagement from fans…until you look deeper. The shares figure was very low (just 340) and the Reactions posted were mostly negative (72% were the Angry emoji). This is a good example of how stats alone aren’t enough to report on engagement. Sentiment and the strength of emotion posted in the comments is an incredibly important measure. When fans react angrily it’s also important to make sure those comments don’t get out of control. Emotions can easily escalate into hate speech and personal abuse. When you’re dealing with hundreds of posts every minute, it’s incredibly difficult for social media teams to keep up with what’s acceptable to the brand and what isn’t. Yet leaving abuse live isn’t an option either. The most Loved post of the season so far: a photo posted on the Pittsburgh Steelers' page celebrating their win against Baltimore Ravens. One of the reasons for the shared Love could perhaps be put down to Josh Dobbs, who made his first regular season NFL pass attempt. Highlighting key plays in a game is a great way for teams to generate engagement and support from fans. We see this a lot with the teams that have a strong social strategy, where they use key points to connect fans with individual players as well as the team as a whole. That strategy can go a little awry though when a much-loved player is traded to another team, but overall it’s an effective approach. What makes fans Angry: the post that has generated the most Angry Reactions so far is a Facebook Live video of Cowboys’ Jason Garrett addressing the media following their loss to the Titans. Of the 5.9K Reactions this generated, the vast majority (75% were the Angry emoji). Losing games is a sure-fire way to generate Angry Reactions from fans (especially when there is an individual that that anger can be focused on). But basically any decision made by a team will generate anger. For instance, the news on the Packers’ decision to trade Ha Ha Clinton-Dix and Ty Montgomery led to a lot of emotion from fans – 39% were angry, 23% were in shock (or at least went with the Wow emoji) and 10% showed sadness at the decision. The Detroit Lions’ decision to trade WR Golden Tate to the Eagles didn’t fare that well either – with 72% of fans’ Reactions being the Angry or Sad emoji. When posts generate this level of feeling it’s again a good time to pay close attention to the comments to ensure depth of feeling doesn’t pass over into abuse against the players or, indeed, other fans. Simple things, like fan queries, can quickly escalate too if they feel they’re not getting a fast enough response (or none at all!). An area not covered in this review is how fans react to individual players’ social media pages too. Comments can quickly spiral out of control if fans are unhappy with a player – whether that’s for behavior on the field of play, or off it. We’ll review this data again at the end of the season, to determine who the ‘Social Superbowl’ winners are. In the meantime we’d like to hear from you on what you expect to see happening in the NFL over the next few weeks! What are the big events that could cause these current stats to change? What records do you think players will break? And which players will break them? Who will cause controversy? And, apart from anything else, who do you think is going to win? Send us your thoughts to partnerships@crispthinking.com or tweet us @CrispThinking. If you’d like more information on preventing the wrong sort of content appearing on your social pages, click below to get your free Social Media Moderation Toolkit. And, as always, if there are any subjects or topics you’d like us to cover, please do get in touch! « Previous post Will 2019 be the year of Social Media Compliance? Julia is Head of PR & Content at Crisp. A self-confessed tech geek, Julia has followed every social media trend since twitter was just making it big in Australia.